For those of you who do not know, Time to Talk Day was four days ago and I missed it! However, as someone who keeps a blog on mental health and is extremely open about her own problems in that area, I feel I have given more than a year’s worth of five minutes talking about my depression, anxiety disorder and mythomania. So, it gives me great pleasure – and I thank him very much for opting to give his five minutes to LaBellaBorgia Speaks – to introduce you to the writing of Jack again, who has written very well and to great effect here previously. You may remember me, I wrote here previously about my experiences with Borderline Personality Disorder (https://labellaborgia.wordpress.com/2014/11/08/living-with-borderline-personality-disorder/). For those, however, who do not, my name is Jack Jeffreys. I am twenty three. I live with Borderline Personality Disorder and Rapid Cycling Mood Disorder (Bipolar). Today I want to talk about Time To Change, a charity aiming to reduce and eradicate mental health stigma. 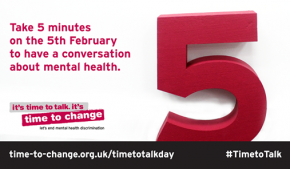 Today, 5th February, is Time To Talk Day. The idea is that you take five minutes to discuss mental health – so get a cup of tea because I’m taking my five minutes with you all now. However, I do not really want to talk about my mental health. I want to talk about the work Time To Change do, and why I think it is vital. Vital in the present, and vital in the future. In our generation and for generations to come. I work with Time To Change through the Advocacy Project based in St. Charles Square, Ladbroke Grove. I do not get to spend a huge amount of time with them because of work, but I give them as many days off as I can afford. We go to public areas, and set up cafes. People can never turn down free tea and cake, and in return we discuss mental health with them. This always starts very one sided, but by the end it completely flips and I am left listening to the random member of the public. This is because so many people have a lived experience of mental health. One in four people in the UK suffer from mental health “issues”. You have to remember mental health is a sliding scale from suffering from stress, through anxiety and depression, up to addiction, personality, obsessive, psychiatric, neurotic, eating, or mood disorders. When you think of it like this one in four does not sound so extreme. At Time To Change we aim to challenge people’s views on mental health, and bring them into the twenty first century. We discuss statistics: one in six people in work in the UK have a mental health condition, and roughly 11% of the population is on anti-depressants. We discuss people like Stephen Fry and Winston Churchill, who suffer/suffered with Bipolar; Jim Carrey, who suffers with depression; Heath Ledger, who suffered with drug abuse; and John Prescott, who suffered with Bulimia. We aim to make mental health something that everyone can relate to. We aim to make mental health less scary. Once we get into a discussion with people, they often start asking questions about mental health. There are some very common mental health myths. Myth: If you suffer from a mental health condition you can be violent and unpredictable. Fact: Suffering from a mental health condition makes you no more violent than anyone else. Only 3-5% of violent attacks are attributed to mental health, and when you consider that 25% of people suffer with some form of mental health, the myth does not really add up. In fact, it actually works the other way. In the US, you are ten times more likely to be a victim of violent crime if you suffer from mental health. Myth: If you suffer from mental health problem you can snap out of it if you try hard enough. Fact: Suffering from a mental health conditions has very little to do with being a weak person, it often requires help, in some form, to get better. Different forms of therapy help different conditions, generally. Mindfulness is the real mental health buzz word/therapy at the moment. Many factors attribute to mental health problems, such as biological factors (genetics or injury) or life experience (trauma and abuse). Many people recover from mental health conditions, but you cannot put time on this. There is no rule for how long it takes to get better; it is not the same as a broken leg. Myth: YOU cannot help someone with a mental health condition. Fact: I know a lot of people with mental health conditions. The little things mean the most. Friends telling them they are there to help or helping them access mental health services. Treating them with respect, just like anyone else. Generally being a friend or family member, just how you were, before mental health became an issue. Refusing to allow someone to be defined by diagnosis – I am bipolar but I do not have to act that way. And making it a ‘normal’ thing. Myth: All you need to do is take tablets. Fact: This works for some people. But for lots of people this is not the whole answer. A combination of therapy and medication is important. In some cases medication is not even required. I believe anti-depressants are drastically over prescribed by the NHS. This is because of an ever reducing mental health budget. Myth: Children do not experience mental health problems. Fact: Half of all mental health disorders show first signs by the age of fourteen, and three quarters of mental health disorders begin before the age of twenty four. There are many more than this, but these are the most common myths we hear. The important thing about Time To Change is the attempt to normalize mental health. Mental health is not going to disappear. In the high stress world that many people live in, it will only become more prevalent. And without wanting to make this political, under the current government, treatment is becoming less available. Therefore it is vital we are in a position to help each other. I guess I am urging you to avoid awkward conversations, and to be that person who talks openly about mental health. Go and do research. Find out the truth. Do not shy away from it. If you have a friend or a family member who suffers with any form of mental health, break down the invisible barriers that exist in society, and talk about it. Mental health is not something to be scared or threatened by. To conclude, I make no apology for not talking about my mental health. If you know me, or have read what I written previously, you will know I am very open and will discuss anything you want to know about me. Today is not about my mental health. It is about building a foundation for our generation, and generations to come. A foundation that allows our friends and family to feel comfortable speaking out and seeking help. Start talking about mental health. Go and have another cup of tea. Go and talk about it over dinner. I’ve taken my five minutes today. Now go and take yours.